1) This paper has been prepared for presentation at the FIG Working Week 2009 in Eilat, Israel, 3-8 May 2009. Key words: Survey of Israel, Geodesy, Cadastre, Geo-Information, NSDI, Geo-Portal, Survey regulations, CORS, Undulation Model, Coordinate Based Cadastre, 3D Cadastre, Mapping, Hydrographic Charting. The Survey of Israel (SOI) is a Government Agency, under the Minister of Construction and Housing, operating since 1948 and is the successor of the British Survey of Palestine that was established in 1920. SOI employs today a staff of 250 government employees and 50 additional staff. SOI is the national organization responsible for licensing, directing and inspecting surveyors, for definition the professional policy and regulations and for creation and maintaining the national infrastructure in geodesy, cadastre, mapping and geo-information. During last years SOI is undergoing a fast upgrade of its technological environment and its activities and services. This paper elaborates on the current status of the activities of the Survey of Israel in the various fields of its responsibilities. This includes geodesy, cadastre and geo-information as well as regulation of the profession. The author serves as the Director General of the Survey of Israel. 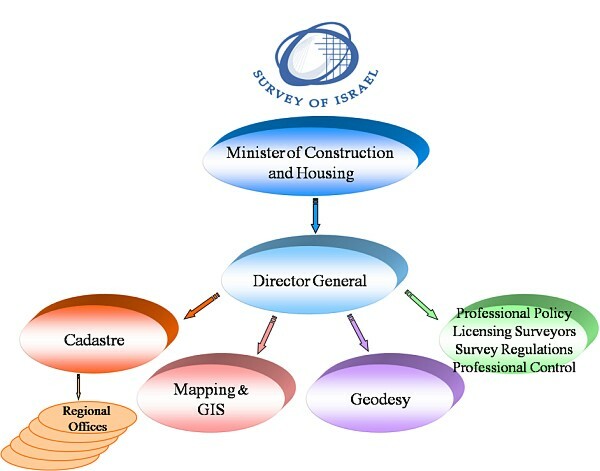 The Survey of Israel (SOI) is a government agency under the Minister of Construction and Housing operating since 1948 and is the successor of the British Survey of Palestine that was established in 1920. SOI employs today 250 government employees and 50 additional staff. SOI is the national organization responsible for licensing, directing and inspecting surveyors, for defining the professional policy and regulations and for the creating and maintaining the national infrastructure in geodesy, cadastre, mapping and geo-information. The main generators of these changes are the need for improvement of effectiveness and the necessity for improvement of service. The processes leading to the changes are connected to the macro economical changes, leading to decrease of government employees and privatization of activities, so that most of the production is outsourced. The changes depend on the technological advancement and on the changing needs of the public who requires better accessibility to information and services and availability on-line. In parallel to sharp decrease of manpower SOI integrated new technologies in the fields of Geodesy, Cadastre and Geo-Information. As a complementary activity SOI prepared new regulations fitting the present status of technologies and the direction of future development. These regulations are now in a legal process before publication. Meanwhile professional directives for surveyors were published by the Director of SOI. Responsibilities with regard to the surveying profession, surveying regulations, professional guidelines of the director, licensing of surveyors, inspection and enforcement and promotion of the profession; research and development; international boundaries and international relations. Geodesy, including the geodetic network. Mapping and geospatial data and services, including hydrographic charting; national archives of maps and aerial photographs. The traditional geodetic infrastructure in Israel consisted of a network of tens of thousands of triangulation points and hundreds of thousands of control points. 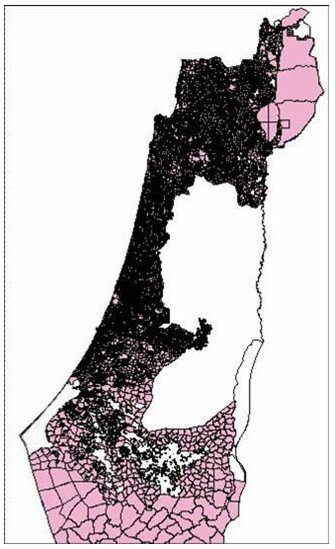 These control points were constructed and surveyed since 1920 when the Survey of Palestine was established by the British Mandatory regime (see Figure 2). 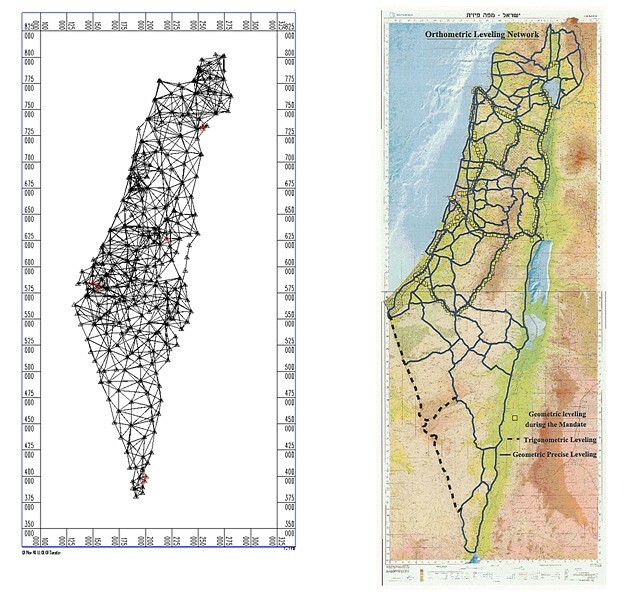 The traditional geodetic grid used to be the Israeli grid, which was based on the Palestine Grid. In 1995 this grid was replaced by the New Israeli Grid, based on additional survey and triangulation (Adler and Papo, 1984). The Israeli cadastre was established in 1928 and is based on Torrence principles. As for today, more than ninety five percent of Israel already went through the basic process of land settlement. 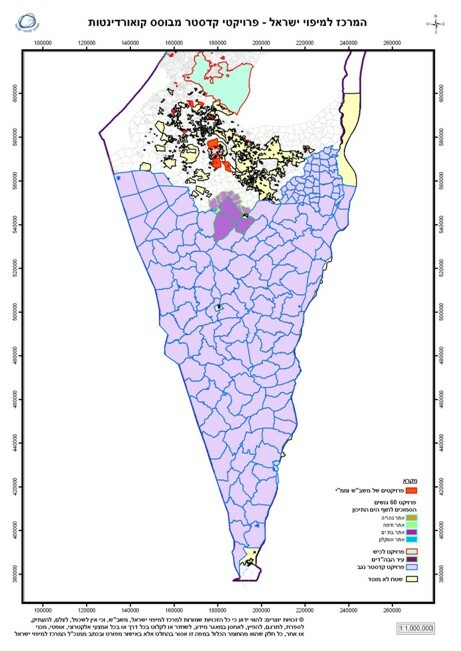 In addition to the slow advancement in the settlement process of the rest of the lands due to complicated land claims, most of the cadastral activities include re-parcelation due to economical activities and land development and preparation of mutation plans (Mutation plans are prepared in land settled areas which following re-planning of the area, require unification of blocks or parcels and new subdivision of parcels which fits the new plan. Mutation plans are prepared by surveyors and approved for registration by SOI). These activities require the control and certifications of the SOI for land registration. Since all the professional documents and data are managed by the SOI, the private surveyors, who took over the traditional job of the government surveyors in preparation of blocks and plans, are required to visit physically the archives of the SOI in order to look for old data, including hard copy block plans, field sheets and field books, or in order to acquire data from the geodetic and cadastral digital data base of the SOI. This process requires a lot of time, both of the surveyors and of the government employees. In addition, the quality of the hard copy materials continues to deteriorate and surveyors face unavoidable problems of inaccurate data due to low quality and due to inconsistencies in traditional data. These problems resulted in slowing the process of survey and preparation of land mutations, including the process of control and evaluation of the mutation plans. Thus, influencing the process of land development as well as causing long delays in land registration. In spite of the high quality of the traditional SOI maps, the national GIS database at the SOI was developed from 1:40,000 aerial photographs since 1991. This has caused problems of compatibility between the GIS and the hard copy maps, as well as problems of parallel investment in updating the two systems. Customers were required to come to the SOI in order to purchase data from the National GIS. The selling models were rigid and not user friendly. This did not satisfy the dynamic developing GIS markets and especially the needs of the location based services industry. This situation was counter productive in spite of the recognition of the customers of the high quality of SOI data. The requirement of the market, including the private market, the government and the public, led SOI to the understanding that there should be a major change towards better response to user requirements. The result of this understanding was to change products, to increase the variety of products, to update the databases more frequently and make data available to users faster, preferable on line. In addition, there was a requirement to improve accuracies. Other results were: to adopt most advanced technologies, to change the production processes and to shorten the production times; to define or adopt standards and specifications for data transfer and for digital products; to improve quality control and data management; to improve the availability and accessibility of data services to the users, either internal or external, and to define new models of service. The leading requirement and basis for integrated geospatial management is to handle the geospatial information on the basis of accurate coordinate based reference. Technology enables this process, and a new geodetic network which is based on satellite permanent stations (APN-Active Permanent Network) was established. The Director General of SOI is responsible for licensing surveyors. A license will be granted for people meeting the following requirement: graduating from a four year geodetic, engineering accredited program, two years of guided experience and special competency exams. SOI is responsible for the preparation of professional regulations to be signed by the Minister according to the Survey Ordinance which has been the basis of the legislation since 1929 under the British Mandate. These regulations contain information about geodetic networks, surveying, cadastral and mapping procedures. The Director General (DG) of SOI publishes professional directives to surveyors to update and augment the regulations and to deal with changing technologies. In addition SOI publishes standards and specifications, to be used by surveyors with regard to additional professional activities, including GIS and hydrographic charting. These standards also implement international standards like ISO and IHO. Part of these standards are taken care by the DG of SOI in his assignment as the chairman of the Governmental Inter-Agency Committee for GIS. The traditional responsibility with regard to the regulation of the profession is characterized by preparing new regulations to cope with the changing technologies, managing the practice of new surveyors and licensing surveyors. During the last decades, survey regulations were published every decade. The last version was published in 1998. The 1998 regulations, focused on the transition to the New Israeli Grid, requiring every surveyor to tie every survey to this grid. Since 1998 the Director General is publishing guidelines (directives). These guidelines include the direction to tie every new control point to Israeli Grid 2005 which is based on the Active Permanent stations (APN). A new version of regulations is in process (Steinberg G., 2006). The new regulations deal with geodesy, cadastre and mapping. The basic part concentrates in geodesy to support both the cadastral activities as well as engineering and topographic surveying. The regulations for geodesy deal with the horizontal and vertical control networks, boundary surveying and measurement of features and heights. The horizontal network, required mainly to serve the cadastre, is aimed towards the achievement of 5cm accuracy (with 95% reliability). This will be based on the new Israeli Grid 2005 (IG05). The vertical grid is supposed to supply a framework of a precise network for engineering and topographic surveying. Due to the unjustified need for investment in orthometric precise leveling, the required precision for 1st order vertical control as specified in the regulations was not achieved. As a result of this fact the team, working on the new regulations, decided to abandon the goal of high accuracy in the national vertical network, and to leave the precise vertical network to the municipal and local level. The new regulations discontinued the requirement for the maintenance of the national orthometric network and replace it by an ellipsoidal network, based in part on the control stations of the horizontal satellite geodetic network, which serve as a three dimensional network. The transformation from ellipsoidal to orthometric heights is specified in the guidelines of the DG of SOI. This is based on a statutory model of undulations. The new cadastral regulations aimed at serving a goal that was specified by the Director of the Survey of Israel to advance practically and gradually towards a coordinate based cadastre in Israel. One step in this direction is the definition and a preliminary approval of an external boundary. Another important step is the definition and approval of a boundary plan which is not registered at the land registry but is a formal document. Additional regulations deal with the transition of coordinates due to the new grid IG05, reconstruction of boundaries, computerized preparation of land settlement blocks, 3D cadastre etc. With reference to the mapping regulations the DG of SOI directed the preparation team to change the concept of the regulations due to the fast changes in technology and to base the new regulations on standards of products and not on techniques and technologies. SOI has responsibilities regarding the international boundaries of Israel. Its staff participated in the boundary demarcation of the international boundaries between Israel and Egypt and Israel and Jordan. The DG of SOI is a co-chair of the Israeli-Jordanian Joint Team of Experts taking care of the boundary issues. This includes the maritime boundaries as well. SOI has been always supporting legislation regarding planning and construction, land settlement and land registration. During the last decade SOI supports legislation regarding the protection of the environment. One of the examples is the definition of the coastlines along the Mediterranean Sea, along the Red Sea and along the Sea of Galilee for the protection of the coastal environment (see Figure 3) (Srebro, 2008). Other examples refer to the protection of mature trees, to 3D planning etc. Figure 3: Examples for the Definition of the Coast line for the Protection of the Coastal Environment. SOI is in charge of national R&D regarding its areas of responsibilities and for domestic and international relations, including with the Academy, to achieve its goals. This includes monitoring the sea levels, monitoring the magnetic field etc. 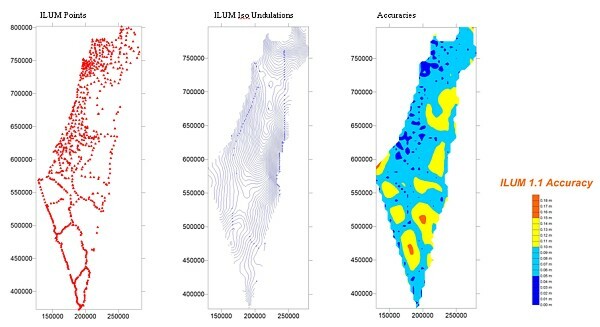 as well as cooperation with the Geological Survey of Israel (GSI) and with the Israel Oceanographic and Limonological Research Institute (IOLRI) and other organizations in exploring the marine bathymetry (see Figure 4). Figure 4: Bathymetric Mapping, Examples of Cooperation with GSI and Other Organizations. The geodetic infrastructure in Israel consists of the horizontal network and vertical network. Both were based traditionally on development, enlargement, densification and enhancement of the geodetic infrastructure of the British Mandate, which was constructed since 1920 in the northern part of Israel. The horizontal network consisted of tens of thousands of control points of various precision grades. The highest precision of the Major triangulation points was at the level of 1:50,000 to 1:100,000. The triangulation network was re-measured. The survey included angles and distances and Laplas azimuths and the triangulation was readjusted to an accuracy of 1:250,000. The vertical network, consisted of geometric leveling, expect the south western part of the deserted Negev which was measured by trigonometric leveling. In the unpopulated areas, mainly in the south, the leveling loops were very wide, bridging over unsurveyed areas. The accuracy of the bench marks of this network is in the range of 3mm to a kilometer. During the last decade a new horizontal network was established on the base of the Active Permanent Network. This Network entered into force by the DG of SOI by publishing formal guidelines to surveyors. The accuracy of this network is in the level of 1-2 centimeters. The core of this network consists of 19 Continuously Operating Reference Stations operated by SOI (see Figure 5). Most of the stations work both with GPS and GLONASS satellites. This improves the effective coverage of the existing stations, especially for RTK (Real Time Kinematic) mode of service. In addition to RTK the permanent stations provide also VRS (Virtual Reference Stations) service for post processing and DGPS service. The importance of the combination of GPS and GLONASS and in the future GALILEO, when this will be possible, will increase in a few years when the expected receiving conditions will decrease. This service is supplied to surveyors with no restrictions, using various models of payment either by subscription or per use. The revenues do not cover the full cost of the maintenance of the APN. The permanent stations are the nucleus of the current Israeli geodetic grid, called ISRAEL GRID 2005 (IG05), (Steinberg G. and Even Tzur G., 2005). G0 – The Active Permanent Network (19 stations). G1 – 150 stable control stations constructed in cooperation with the Geological Survey of Israel, (GSI) used originally for monitoring the geodynamic movements of the earth. These stations are measured periodically (every 5 years since 1997) with reference to G0 stations. The third round of measurements was conducted in 2008. SOI is considering adding 40 additional control stations which were constructed lately by the Geological Survey of Israel for monitoring the movements along the Afro-Arabian Rift. The advantage of this cooperation is the stability of the constructed control stations which are drilled sometimes to a depth down to 12m. G2 – 1,500 control points measured with reference to G0 and G1 stations. These points were measured during the last years and serve actually as a three dimensional network. These points define the formal national geodetic reference system, and are of highest accuracy. Additional control points will also be incorporated in the new geodetic data base. These are control points measured by private surveyors and controlled and certified by the SOI. They are denoted as S1 and S2 points. These points will be considered at lower quality than the main points (G0, G1 and G2). In spite of that, even the accuracy of the lower quality control points (S1, S2) is higher than the accuracy of the traditional (readjusted) Major triangulation points. In addition to the new network a series of professional guidelines were published by the DG of SOI in the interim phase before new regulations are prepared and enter into force. The traditional vertical control system is based on a network of benchmarks measured by precise geometric leveling. The requirement in the regulations for a 1st order orthometric control network is 2mm √Lkm. This is not achieved and the requirement for the maintenance of unstable benchmarks is too high. SOI supplies a national orthometric vertical network of 3rd level to which the local authorities tie their local vertical network. The accuracy of this network is 15mm/km which supports a basic national network. Local islands of vertical networks of benchmarks, with better accuracies, which are prepared by local authorities, are tied to the national network in the limited level accuracy of 5-10cm. In order to optimize the investment in the maintenance of the vertical orthometric network, SOI decided to implement an ellipsoidal vertical network, based on 700 control points measured by precise leveling as well and with reference to the APN of which the G0 stations have 5mm vertical accuracy, G1 points have 10mm vertical accuracy and G2 points have 20mm vertical accuracy. An innovative approach was implemented in the professional guidelines for the vertical reference based on implementing a statutory undulation model (Steinberg G. and Even-Tzur G., 2006). The undulation model which was developed in SOI (IsraeL Undulation Model – ILUM) using a network of 840 points which have orthometric heights and which were measured by GPS measurements and have ellipsoidal heights in ITRF2000. The density in the north is high but in the south the loops are wide confining large empty areas of low accuracy. The absolute accuracy of the model is better than 10cm in most of the areas except where the density and homogeneity of the orthometric and the ellipsoidal bench marks are low. The use of the model for transformation of ellipsoidal heights to orthometric heights supports accuracies of 3-18cm, but its relative accuracy is better than 25 ppm. The rate of undulation in Israel relatively to the reference ellipsoid WGS84 is in the range of 24m in the north to 17m in the south (Even Tzur G. et al., 2006). The maximum inclination of the ellipsoid relatively to the Geoid in Israel is 14cm to 1km in the area of the Dead Sea (see Figure 6). Until 1928 the cadastral system in Israel used to be the Ottoman deeds system. The owners were registered and the transactions were recorded. In 1928, under the regime of the British Mandate, this was changed to a register of properties following the Torrence principles. The state guarantees the record of the title. The Survey of Israel is responsible for the verification and approval of the correctness of the plan. The Register at the Ministry of Legal Affairs is responsible for the registration and for management of the land records. The land settlement, which began in 1928, covers today about 95% of the State of Israel. This includes about 16,000 live blocks (see Figure 7). Additional few thousand blocks were canceled during the years and replaced by other blocks. These blocks contain 800,000 parcels. More than half of the country, mostly in the unpopulated south, is divided to wide blocks containing one to several parcels. These are state owned lands. The annual rate of progress of the land settlement is around 200 new blocks, while the expected volume to accomplish the land settlement is 3,000 new blocks. There are initiatives to accelerate the process, especially in the area of the Bedouins in the south, in order to reconcile frictions and disputes. During the British Mandate the land settlement was executed by government employees, the surveyors of the Survey of Palestine. This used to be the situation also after the independence of the State of Israel until about thirty years ago. Today the preparation of block plans and mutation plans is executed by private surveyors and the verification and approval for registration is done by SOI. Most of the activities in the cadastral area refer to mutation plans. The fast accelerated development of the State of Israel, growing from a population of around one million people 60 years ago to more than seven million people today, is reflected in the growing rate of mutation plans. The annual number of mutation plans which has to be verified and approved by SOI is 1200-1450 plans. The current status of the cadastral activities includes a computerized environment of the land survey and office work for the production of the mutation plans. The historical archives are partly computerized and the management of the cadastral data base is integrated in a cadastral GIS which serves the requirements of management. Since most of the data of the traditional block plans was digitized from the graphic hard copies it is not accurate enough for the registration itself. The field survey is performed by private surveyors, who have to come to one of the SOI offices in order to assemble the required reference data, and in order to get confirmation for the specific produced control points. In addition to the approval of the control points, an approval of the mutation plans is required as well. Two major measures were taken during the last years for acceleration of the control and approval of the mutation plans. One measure was internal, including a development of a unified overall command and control system (Forrai J. et al., 2004 and 2008). This command and control system is important in order to unify the procedures, since there used to be a wide variance between the requirements of the different district offices. Thus, the private surveyors complained that they have to adapt their plans to the district offices. In addition the administrative management in part of the offices was manual. The new system directs the supervising surveyors throughout SOI, including the district offices, to unify their requirements from the surveyors. It unifies the inspection procedures and automates the administrative management to better control the overall activities, enabling flexibility in sharing tasks and tracing and improving the overall efficiency. This accomplishes the standardization of the surveying procedures which had been implemented for years and the resulting files as well. The other measure was external, refers to outsourcing the assessment and confirmation of mutation plans by nomination of supervising surveyors (Forrai J. and Kirschner G., 2009) to cover up to now third of the annual amount of mutation plans. This step of granting authority to external supervising surveyors happened to be a great success. In 2008 the throughput of these supervising surveyors was around 400 mutation plans which was almost one third of the overall production (Forrai J. and Kirschner G., 2009). This external activity, which had components of competition with the internal supervision had a positive influence on the internal work and improved the internal efficiency as well. 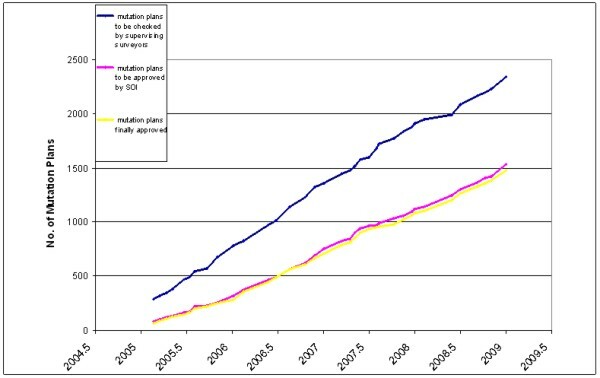 As a result, 2008 was the first year for many years that the overall output of certified mutation plans was bigger than the number of new plans. As an improvement to the original plan, two of the external supervising surveyors were granted permission to supervise mutation plans of their colleague supervising surveyors. As a result of this success a new bid is published for an additional 5 years term of supervising surveyors with improvements resulting from lessons learned. Figure 8: The Production of the Supervising Surveyors. In addition, first functions of direct access of the public to cadastral managerial data were launched successfully using the internet, referencing blocks and parcels to addresses and supplying historical data of blocks. A few projects were executed in order to progress toward a digital coordinate based spatial cadastre. These projects include 3D cadastre projects. The accelerated development in Israel, especially in the center and the north, which are densely populated, require a practical and legal solution, which will enable registration in three dimensions, both under and above the ground. A R&D 3D cadastre comprehensive project was conducted (Shoshani U. et al., 2004), followed by a few implementation projects, required for planning multi-dimensional sites. These projects include the following cases: Accommodation sites and/or commercial complexes above or beneath archeological sites, underground traffic tunnels and interchanges. The suggested solution included preparation of the multilayer cases for spatial land registration. The planning, the management and the land registration in these cases should be handled on a coordinate based reference, usually on a GIS platform. The result of the R&D project introduced a comprehensive solution, defining sub division of spatial sub parcels. In the future this should expand also to the management of changes in the dimension of time (see Figure 9). For the time being only few special cases are taken care of with cooperation between the Survey of Israel, the Land Management Authority and private surveyors. Up to date the results enable potential 3D registration, but this is not implemented yet because the legal arrangements are not prepared yet. Therefore these projects are taken care only from the technical point of view, planning, engineering, geodesy and management. There is a wide understanding that an accurate coordinate based cadastre (CBC) should replace the existing hard copy map based cadastre. This understanding is shared by the three components of the professional community in Israel: The Survey of Israel, the academy and the private surveyors. A CBC would contribute to handling lands as a commodity in the commercial market. It would accelerate the registration process, increase the precision of land management and reduce friction and disputes which lead to courts. The current geodetic infrastructure based on the APN supports a CBC enabling real time and high accuracy. The required legal effort is challenged especially because of the problem of differences between the registered parcel areas and the accurate parcel areas, as computed from the coordinates. This is relevant to property rights and requires legal solutions. But there is an option to accomplish most of the migration from the hard copy database to a coordinate based database without the registration itself. This will enable a surveyor, who prepares a new mutation plan, to refer to the coordinates and just to check for the existence of authentic points in the area, saving him the current requirement to look for old hard copy files and to execute a complicated, time consuming, research. The biggest challenge of migration from the old hard copy to CBC is the certainty of reconstruction of the original boundaries. For this purpose there is a significant importance to the identification of old authentic points, either control points or physical stable constructions. These authentic points contribute to the accuracy of the transformations. The changes of coordinates and areas, which result of the improvement of accuracy due to the use of modern technologies, can be taken care better than those which result of mistakes of reconstruction of original boundaries. Due to the high cost of the project of transforming legacy cadastral data into CBC a few feasibility studies were carried out as well as an economic assessment. The economical assessment showed high revenue in such a project. The feasibility projects showed a requirement for different approaches in different areas like state owned open and unpopulated areas, agricultural areas, areas with low populated density and areas with high population density. The fastest and cheapest areas to take care of are state owned, unpopulated lands, where it is easy for the state to change limits and areas. The most complicated areas are private owned or leased areas in the cities, where the economic significance of any change may be dramatic. In addition, the pilot projects showed the importance of locating and surveying old authentic points which disappeared due to accelerate development and are required as anchor points for future transformations. As a result of the pilot projects, SOI is leading an effort of transforming around two thirds of the lands which are state owned unpopulated or sparsely populated lands. This should be a relatively low cost project, which can be accomplished in 4 to 5 years. Meanwhile, additional pilot projects will be conducted and the accumulated experience will improve the assessment and support a program as to the way to proceed in more complicated areas. The existing cadastral GIS will be improved gradually by accurate coordinates, produced through the CBC projects and every corner point will have an attached accuracy estimate to support surveyors. SOI launched recently a CBC project in the south (the Negev area) covering 50% of the State of Israel (see Figure 10). Due to the fact that the area is state owned and mostly unpopulated, the cost of the project will be less than one percent than a full coverage of the state! This includes location and identification of original authentic points. In parallel, a process is developed for the creation and treatment of CBC, as a special track in the Cadastral GIS. In addition, other areas, which are relatively easy to be taken care of, are considered for transformation to CBC. Since the technology of surveying and handling new mutation plans is both accurate and fully analytical, the annually produced 1200-1450 mutation plans are added naturally to the CBC infrastructure in the cadastral GIS. The DG of SOI also suggested on the preparation of a maritime CBC, covering the Israeli Territorial Sea, as an infrastructure for future potential projects. Figure 10: The CBC Project in the Negev. Since 1991 a National GIS was created by SOI to serve the government ministries and agencies as well as to support the community of nation-wide geospatial consumers. The data source of the National GIS was based on triangulated aerial photographs, taken at 20,000' altitude, using analytical and digital photogrammetry. The current revision cycle is 2-3 years, except for roads and orthophoto which are revised annually. 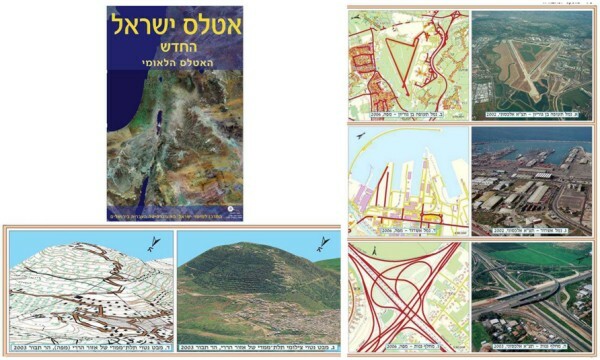 The National GIS of the Survey of Israel consists of a topographic data base including ten topographic layers: orthophoto, elevations, roads, buildings, hydrographic features etc., a cadastral database including blocks and plans, and a database of addresses. The National GIS infrastructure consists of the spatial data infrastructure of the Survey of Israel and of many government offices as well as medium and large cities and towns, utility companies and public organizations. Orthophoto production and data collection is carried out by the private sector. This is the main trend, and Israeli companies provide integrated geospatial products and services, orthophotography, mapping, GIS, cadastre, visualization tools and more. The usual mode of cooperation between SOI and the private sector is that SOI defines the specifications; private companies carry out the data collection and the staff of SOI does quality control and integration of the data into the National GIS (see Figure 11). Then, SOI provides data and services directly to the end users. The implementation of imagery technologies is highly developed in Israel since 1973. This led to development of the local industry. Israeli manufactures supply satellite imagery all over the world. Recently, Israeli digital aerial cameras influence the photogrammetric market. These developments caused SOI to update the regulations in order to certify the use of non traditional aerial cameras for mapping applications. Figure 11: The Status of the National GIS. Another activity in SOI, regarding the National GIS, is to integrate the hydrographic data, which was collected for the production of the hydrographic charts, with the topographic GIS in order to create a continuous GIS covering the land and the sea. The main challenge of this activity is to overcome the different standards that are used for land information and for hydrographic information. Around two years ago a SOI launched the National Geospatial Portal (NGP) (Srebro H. et al., 2006 and Srebro H., 2008). This portal has been developed in cooperation with the Inter-agency Committee for SDI. The portal is already operating for two years. It is part of the e-Government initiative and serves simultaneously as a geospatial portal for the public and a governmental GIS clearing house. For the time being it serves the public free of charge. Following a thorough analysis of the options, the decision was made to build a geospatial data warehouse at the first stage, in order to improve the quality control of data. This approach was adopted because of the variety of data sources. Though the quality of data based on the National GIS is very good, one cannot assure the quality of uncontrolled data coming from all ministries and agencies, so that integrated applications of the simple end web-user may not meet the expected standards. Following the resolution of the Inter-agency Committee with reference to the national geospatial meta-data standard based on ISO19115, this standard was adopted for the portal as well. Meta-data for 400 layers of geospatial data has already been prepared and is accessible in the system. The system works quite fast and passed successfully loading simulations. Potential users are exposed to the portal and are very satisfied with it, including the education community and potential emergency applications. The first objective of the portal is to consolidate, to integrate and distribute geospatial data following the e-Government policy of making the data available to the public. The second objective of the portal is to serve as a clearing house of geospatial data between governmental offices and thus to save governmental investment and to improve compatibility and integration between governmental offices regarding geospatial and location based applications. The expectation is that the exposure of data will also stimulate processes of improving the quality and precision of the data. A steering committee of the two organizations headed by the Director General of the Survey of Israel (who chairs the Inter-Agency committee) defines the goals and confirms the planning. A working team of the committee defines the requirements and controls their achievement while working teams of SOI are responsible for their execution. The main components of the system are: data collection, data integration, simple web operational search mechanisms, national geospatial meta-database, data sharing and data distribution mechanisms and a variety of links to GIS and mapping web sites. The architecture of the NGP is based on servers in the SOI, which operate as a Data Warehouse supporting, via intranet, internal users of SOI and distributing the data to an identical environment at the central web site of the government using its services, including security of data. The government site data is distributed to the various government offices including web services and via Fire Wall and the internet to the public. The mode of interaction between SOI, the government offices and the public is as follows (see Figure 12): SOI collects GIS data of various government offices and public organizations using the coordination of the Inter-Agency Committee for SDI, checks the data and integrates it into the Geospatial Data Warehouse of the Portal. 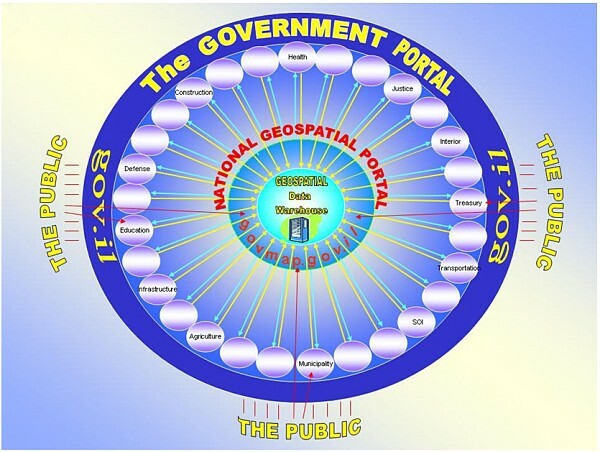 The public (the web users) can either query the NGP directly for pure geospatial subjects, or access via the government portal, a portal of a government office for a complicated issue. 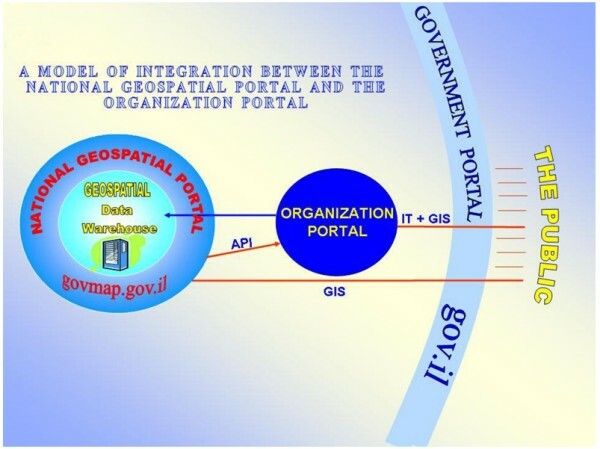 The portal of the government office will integrate its internal IT and GIS data extracted by the NGP using API (Application Programming Interface) (see Figure 13). The core of the National Geospatial Portal is a Geospatial Data Warehouse that includes more than 120 layers of geospatial data collected by governmental organizations, thirty of which are from the SOI. The Portal represents data with great variability and richness that enable the system to sort the layers under main topics and the user to extract relevant metadata. The portal is integrative and the data includes many thematic layers, such as basic mapping (roads, buildings, addresses, orthophoto, contours, hydrology, institutes, various scales of raster topographic layers etc. ), layers of cadastre and planning (blocks, plots, town plans, master plans, land reserves, etc. ), tourist information (national resorts, national parks, hiking trails, forests, woods, parking areas, etc. ), administrative boundaries, transportation, infrastructure, security and national emergencies. The portal enables simultaneous presentation of multiple layers of information, with high cartographic fit, linked to attribute information in various formats according to the spatial entities. In addition, and based on the general data in the system, there are engines that enable links to other databases, that might give specific information in special operative applications in the future, for internal governmental usage. The Geospatial Portal is the main platform for the online services of the Survey of Israel to Governmental agencies, to the general public and to the professional community including private surveyors. The use of the Active Permanent Stations, which operate today through the internet in a separate track. A direct access to the National Geodetic Data Base (NGDB) (see Figure 14), which will open this year. An on-line communication with surveyors for the evaluation of control points surveyed by private surveyors. This will operate next year. A direct access to the cadastral data base. An on-line communication with surveyors for the evaluation of mutation plans. This will work next year. A direct access to the National Archive of Maps and Aerial Photographs. This will operate next year. A direct access to the cadastral GIS, to the topographic GIS, to a cartographic data base and to the geospatial data of the Survey of Israel and of other governmental and public organizations. This operates today through the Geo-Spatial Portal and will expand in the future. 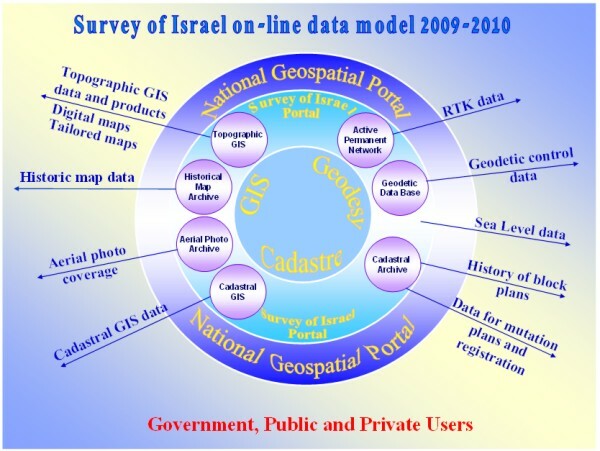 Figure 14 shows the Survey of Israel on-line data and services model. Figure 15 shows the system interface configuration, describing schematically the relationship between the internal production environment and the external service environment. Figure 14: The Survey of Israel On-line Data and Services Model. Figure 15: The Relationship between the Internal Production Environment and the External Service Environment. The Survey of Israel used to print a full range of maps, from small scale of all the country to town maps and large scale topo-cadastre maps. Following the changes in the market, where GPS navigation, private mapping and internet maps play an important role, SOI reduces its map printing activities. Currently the main products are: 1:250,000 and 1:400,000 basic maps, both physical and travel maps; 1:50,000 topographic series, mainly for nature hiking, augmented by selected coverage of 1:25,000. The production line of these maps is undergoing a major shift. During last years SOI developed a process of automation, including generalization, of parts of the production of these maps directly from the national GIS. In addition, customers can get a tailored made map on demand from the national GIS. 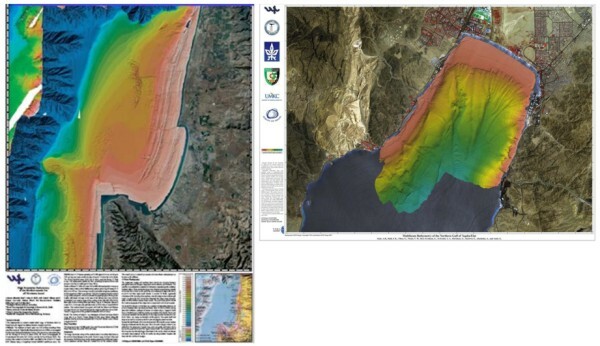 A special project of hydrographic mapping ended recently, covering the Mediterranean coast of Israel by 10 maps, used mainly for safety of navigation. These maps employ data which was collected in cooperation with other agencies, conducting new bathymetric surveys. The current effort is to produce a hydrographic chart of the head of the gulf of Eilat/Aqaba. The New Atlas of Israel – The National Atlas, published recently, is considered a special achievement of the cooperation between SOI and the Hebrew University of Jerusalem. This Atlas, which depends on the most official and reliable data, and is a result of intensive research of academic prominent figures, is an important contribution of SOI to the public and especially for education in the field of Geography. The advanced technologies, which were used for the analysis and production, contributed to the final results and are highly appreciated by geography teachers and students. 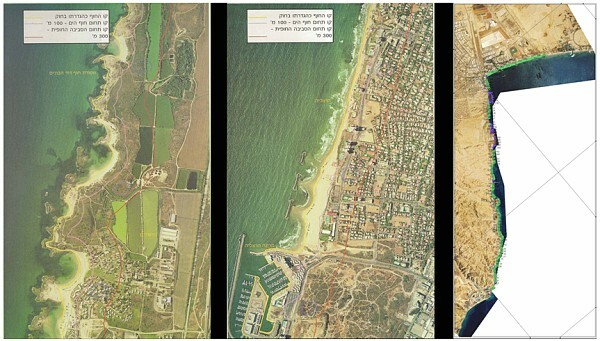 Figure 16: Examples of The New Atlas of Israel. SOI is maintaining the National Archive of Maps and Aerial Photographs, being considered as an extension of the Israeli National Archives. These archives contain about 800 thousand aerial photographs and more than 100 thousand maps. The maps were scanned and during next year will be available on-line during the next year. The aerial photographs include photographs of Palestine from WWI and from WWII and annual coverage of Israel for more than 50 years. The coverage is planned to be available on line next year. The photographs are easily accessible, but the scanning of the entire photo archive is yet a big challenge for the future. The Survey of Israel is undergoing a revolution in its way of thinking and its ways of activity. The important issue is the focus on service, the focus on interaction with the public, with other government and public agencies and with the private market. In a changing world, following a trend of significant decrease of manpower, and changing expectations of the customers, including alternative suppliers of data and services using the internet, the organization has to adapt itself to the changing environment and to change itself. Otherwise, the organization will loose its relevance. One major step that the Survey of Israel adopted is to turn all its services to on-line and to make the data accessible to the public. These steps come in addition to the basic requirement from the Survey to be a leading professional organization. The Survey had always high reputation regarding the expertise and professionalism of its staff. The expertise of the staff should be maintained and continuously developed. Following the current trend, the future of National Mapping Agencies will be based on online services both to the general public and to other government and public organizations. This refers to geodetic services based on satellite permanent stations (combining GPS, GLONASS and GALILEO) both for horizontal and vertical references. 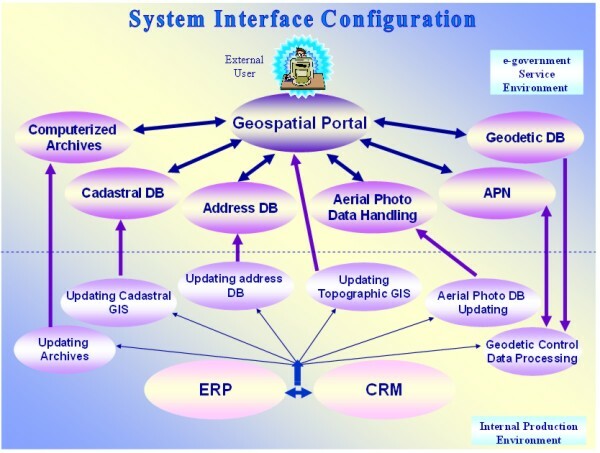 It refers to coordinate based cadastral framework, databases and computerized archives as well as supporting control of cadastral mutations based on the permanent stations. This refers also to geospatial databases including rectified imagery (either from aerial photographs, or satellite images), topographic data, addresses and more. The data integrated in the SOI GIS should be accessible through the web, through geospatial portals, either free of charge, or selectively accessible due to security, or payment policies. The geospatial data should be accessible to government agencies for integration with the IT infrastructure for integrated web services through web portals. A special attention should be paid to the use of geospatial information by geography learning portals for the full range of users between kindergartens and university graduates. These activities should be taken care of by partnership between the government and the private market. The government should define the vision, the goals, the specifications and supply budgets if necessary, while the private sector should be the contractors and sometimes also promote initiatives. The author thanks his predecessors and leading persons of the Survey of Israel who contributed to the processes leading to its current developed status including Dr. Ron Adler, Zion Sitruq and Aviel Ron. He thanks senior SOI technical persons including Giora Golod, Dr. Joseph Forrai, Dr. Gershon Steinberg, Dr. Yuri Raizman and Jochanan Gavish including advisers as Prof. Ammatzia Peled and Dr. Gilad Even-zur, and additional employees who contributed to the achievements described in this article including Gilli Kirschner, Moshe Rozenbloom, Yossi Melzer, Marina Kozakov, Dr. Yaakov Tuchin, Lyubov Kagansky, Einat Salmon, Michael Klebanov, Ytzhak Fabrikant, Larissa Voznesensky, Vera Lavan, Moshe Benhamu, Dr. Yaron Felus, Yaakov Bar-Lavi, Yoav Tal, Baruch Peretsman, Shmuel Bloch and many others. Special thanks to Dr. Gershon Steinberg, Dr. Joseph Forrai and Dr. Yaron Felus for their constructive comments and to Rachel Saranga and Lea Ezra. Adler R. and Papo H.B., 1984, Change of Projection Following Readjustment, The Cartographic Journal, Vol. 22, pp. 138-140, 1984. Forrai, J., Murkes, S., Vosnesensky, L. and Klebanov, M., 2004, Development of a Better Cadastral Practice at the Survey of Israel, FIG Working Week Athens, Greece, May 22-27, 2004. 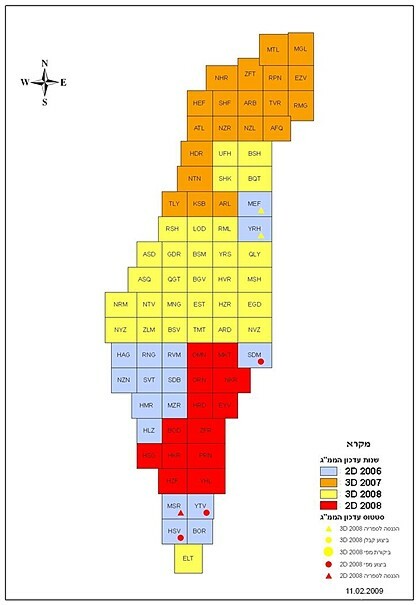 Forrai, J., Gavish Y., Voznesensky L. and Bar-Maor A., 2008, Development of an Advanced Cadastral Management System at the Survey of Israel, submitted to FIG Working Week 2008, Stockholm, Sweden 14-19 June 2008. Forrai, J. and Kirschner, G., 2009, Introducing Supervising Surveyors – Five-year Experience of an Unusual Governmental Enterprise, Submitted to FIG WW Eilat, 3-8 May 2009. Srebro H., Bar-Lavi J. and Weiss B., 2006, A National Geographic Portal, GSDI-9, Santiago, Chile, November 2006. Srebro H., 2008, Geospatial Initiatives in Israel, GIS Development, Vol. 12 Issue 1, January 2008. Srebro H. 2008, The Future of the Survey of Israel: On-Line Services, FIG Working Week 2008, Stockholm, Sweden 14-19 June, 2008. Shoshani U., Benhamo M., Goshen E., Denekamp S. and Bar R., 2004, Registration of Cadastral Spatial Rights in Israel – A Research and Development Project, FIG Working Week Athens Greece, May 2004. Steinberg G. and Even-Tzur G., 2005, Establishment of National Grid Based on Permanent GPS Stations in Israel. Surveying and Land Information Sciences, 65(1): 47-52. Steinberg G., 2006, New Survey Regulations for Israel, XXIII International FIG Congress, 8-13 October 2006, Munich, Germany. Steinberg G. and Even-Tzur G., 2006, Permanent GNSS Networks and Official Geoid Undulations Model as a Substitute for Orthometric Control, XXIII International FIG Congress, 8-13 October 2006, Munich, Germany. Dr. Haim Srebro serves as the Director General of the Survey of Israel since 2003 and is the Conference Director of FIG Working Week 2009. He was awarded B.Sc. in Civil Engineering and M.Sc. in Geodetic Engineering from the Technion, Haifa, and was awarded Ph.D. from Bar-Ilan University. He has 40 years of experience of managing big projects of photogrammetry, geodesy, cartography and digital mapping. He is chairman of the Israeli government Inter-Agency Committee for GIS and a co-chairman of the Israeli-Jordanian Joint Team of Experts dealing with the international boundary. Dr. Srebro has been for the last 35 years a leading figure in the delimitation and demarcation of the international boundaries between Israel and its neighboring states including Egypt, Jordan, Syria and Lebanon. He was responsible for and signed the land and maritime boundary delimitations between Israel and Jordan as part of the Peace Agreement.